Wonderful vintage photograph, presumably late 19th or early 20th century, of two men at a work site along the shore. 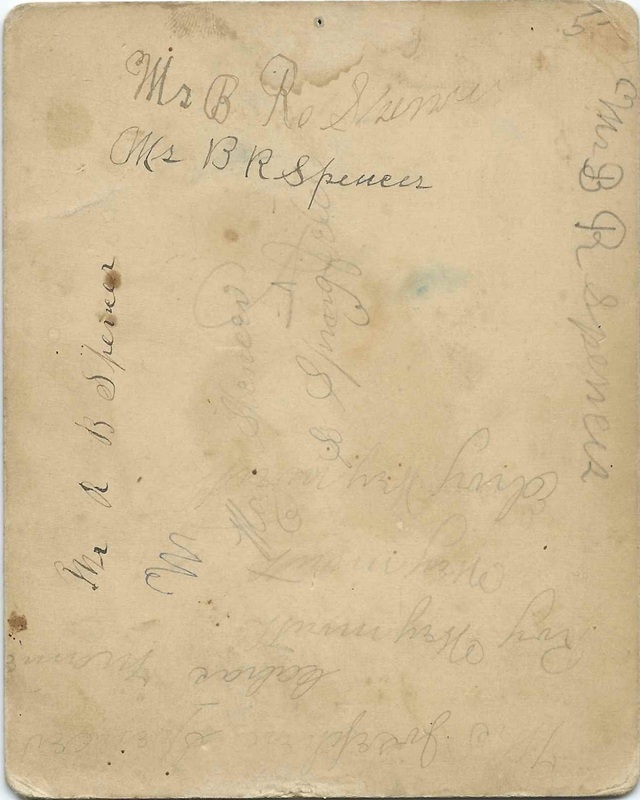 Handwriting on the reverse mentions S Springfield and Calias, which may have been South Springfield, Maine, and a misspelling of Calais, Maine. Several names also appear; see below. 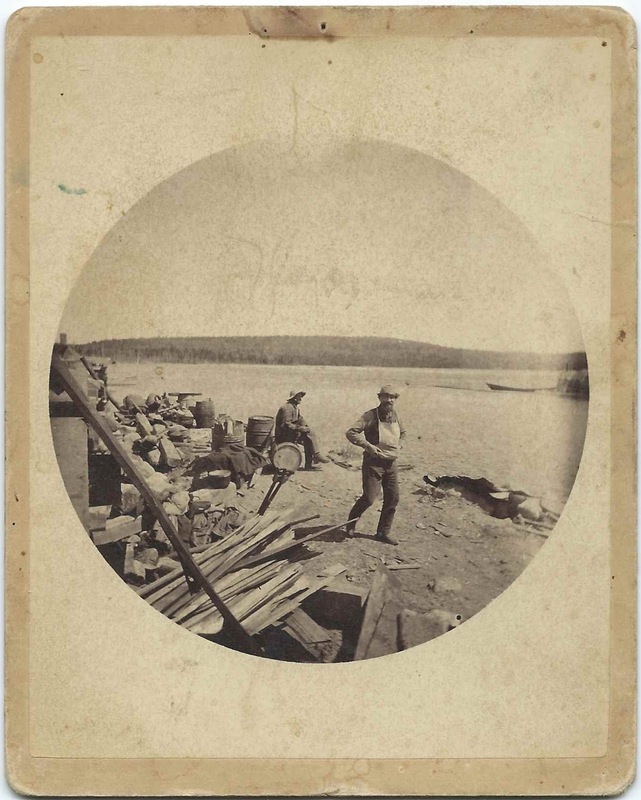 From these clues, it's likely that the photograph was taken at one of the many lakes in the Springfield, Maine, area. Mr. B. R. Spencer may have been Bartlett Richard Spencer or his son Byron Richard Spencer, though I suspect the former is more likely. Bartlett Richard Spencer was born about 1843 in Maine, the son of Richard Spencer and Eliza (Greenlaw) Spencer. He married Alice Rosalind White; they had several children, including Byron, Warren and Winnie. Another post features a photograph of Winnie J. Spencer, daughter of Bartlett Richard Spencer and Alice Rosalind (White) Spencer. She was born July 13, 1882 at Kossuth, Maine. Bartlett died in 1896, so if he is the Mr. B. R. Spencer in the photograph, and if he is one of the men shown, the photograph would have been taken no later than 1896. 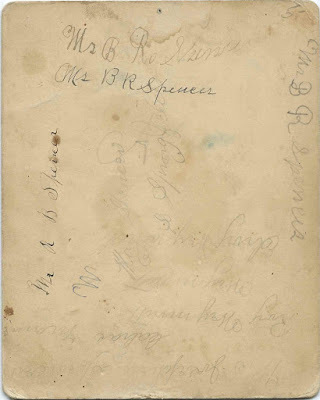 Several members of the Spencer family, including Bartlett, Alice and three of their children and a grandson, are buried in the South Springfield Cemetery at South Springfield, Maine. Interestingly, there was a Leroy T. Wentworth who lived at Lakeville, Maine, on one of the lakes near Springfield. He was born about 1866 and married Ida J. Phillips on June 12, 1892. Leroy, Ida and other Weymouths are buried in the Lowell-Moores Cemetery at Carroll, Maine. If you have corrections and/or additions or alternative theories as to the identities of the people mentioned above, please leave a comment or contact me directly.